Artichokes are a high fibre vegetable that might be a good whole food addition to your diet. There are many layers to an artichoke. The outer green petals envelop inner purple petals. Beneath all of the petals is the hairy choke of the plant, which sits on the delicious heart of this veggie. Within these many layers are also has many health benefits. Below we examine artichokes nutrition facts. Like many vegetables, a medium-size artichoke (128g serving size) is mostly water. In fact, 109g of the 128g are water. Artichokes are a good source of vitamin C, vitamin K1, Folate, along with many minerals including magnesium, potassium, and copper. Artichokes are also a great way to get iron from a non-animal source. One of the main benefits of artichokes is their high level of dietary fibre. A medium artichoke has 6.9g of fibre, which is a significant percentage of your daily value. 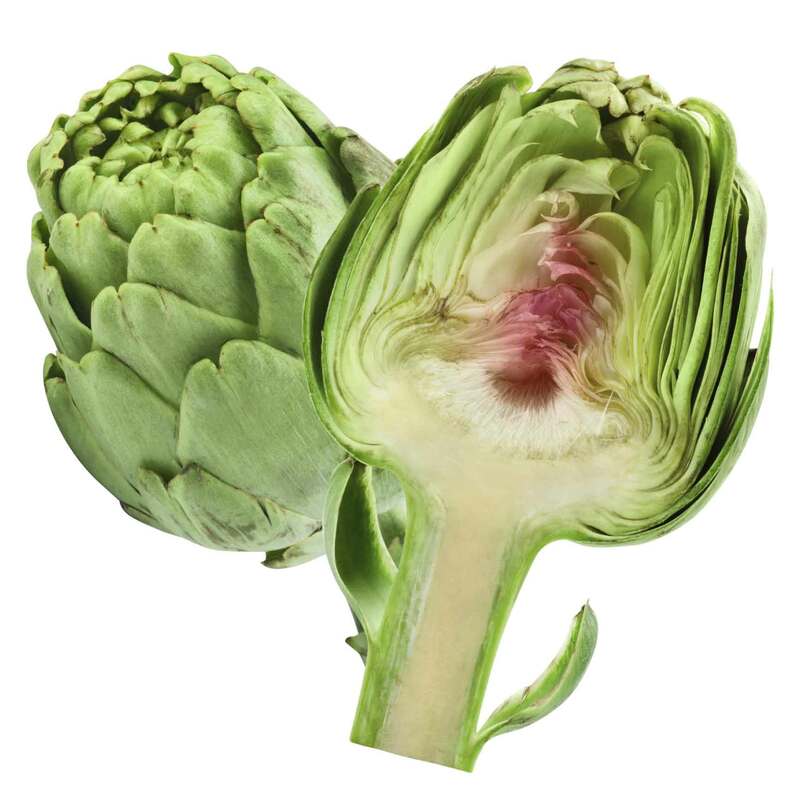 Inulin (not insulin) is one of the fructan fibres found in the artichoke plant. Inulin is a prebiotic, promoting the growth of bifidobacteria. A prebiotic is a non-digestible carbohydrate that works as food for probiotics. Bifidobacteria works as a probiotic, healing and promoting proper health in the gastrointestinal tract. Inulin also helps reduce constipation. A 2013 study showed that inulin might contribute to weight loss. Unfortunately, there is also a downside to fructan fibres like inulin. These fibres are high FODMAPs. FODMAP is short for Fermentable Oligo-, Di-, Mono-saccharides and Polyols, which are short-chained carbohydrates that the body can’t digest. The problem with high FODMAP foods is that they have been associated with some serious gut troubles. High FODMAP foods, like artichokes, can cause gas, bloating, stomach pain, diarrhea and/or constipation. This isn’t a universal problem, but anyone with irritable bowel syndrome is at a high risk of experiencing these symptoms if they regularly eat these foods. Inulin is in many plants including asparagus, garlic, bananas, onions, and wheat. This is a plant-based carb that is used to store energy and is not found in animals or humans. Artichokes also contain a natural sweetener called fructooligosaccharides (oligofructose), which has been shown to lower the body’s hunger hormone ghrelin. This means that we are less hungry and our appetite decreases. This is a powerful tool for losing weight. Artichokes are also a great source of antioxidants. We already mentioned that they are a good source of vitamin C, but they’re also packed with quercetin, rutin, gallic acid, and cynarin. Antioxidants reduce the number of free radicals in the body and oxidative stress, which can lead to most major diseases. Artichokes also contain cynarin, which results in an increased production of bile. Bile is produced by the liver and helps with digestion and the absorption of nutrients. In summary, artichokes have their pros and cons. They are a good source of nutrients and antioxidants and can help you lose weight. They can also have many unpleasant side effects on your gut, possibly exacerbating leaky gut. For the majority of people, artichokes are a good whole food option, and a great way to add fibre to your diet. Always be careful when adding new foods to your diet.